On March 1, 2010 seminar on “Constructive teaching technology and perspectives of nanopsychopedagogy” was held at Curriculum Center. Abdulla Mehrabov, the director of opening seminar with introductory speech, stated that, seminar was dedicated to “Constructive teaching technology and perspectives of nanopsychopedagogy” which is interactive teaching of seminar. Academic Abdulla Mehrabov stating the actuality of report proposed for discussion, stressed the new conception of psychopedagogy and new nano view and he stated that, he is sure that the development brought by nano, will be brought by pedagogy and psychology and she gave the speech to the director of “Idrak”(School of Cognition”) for report. Mrs. Fatma Bunyadova’s report consisted of 4 parts. 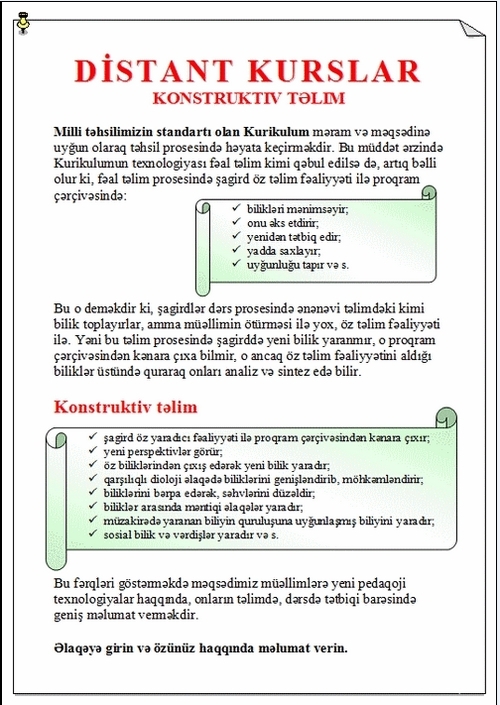 Foundations of implementation of “National Curriculum” that is education standard of Azerbaijan Republic. What changes will CT bring to education? Mrs. Fatma Bunyatova revealing three structures of Constructive Teaching, revealed knowledge structures, logical operations and students’ learning activities which embraces this model in itself. Development of students’ mentality go through logical operation process which are on mutual learning activity and in this process the traditional structure of learning content is destroyed and is established on new structure-horizontal structure. 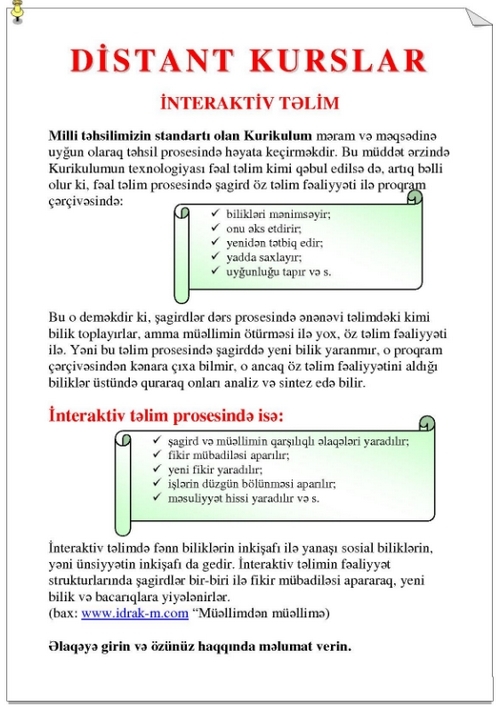 in a new horizontal structure told that, constructive teaching will bring the following novelties to education in XXI century. The technological method of education leads to changing of objectives and is substituted with notion, knowledge, application and reproduction and (Generation). Knowledge units transforming into unit nanostructure knowledge models teaching content logically and this model diminishes learning time 20-30%. High technological approach to pedagogical process creates the new direction of new nano-psychopedagogy in teaching and rearing process. And it will meet the requirements of technological century where we live in. One fielded thinking mentality is substituted with multi-fielded mentality. The manipulation opportunity with human consciousness decreases. A student’s mentality who aimed at self-cognition and self-improvement is prone to lifelong thinking, finding and applying knowledge by mastering thinking mechanism. The lesson’s consisting of two parts, and each part’s serving for what objectives, teacher’s and student’s role in these kinds of lesson and information on CT were explained at practical part of the report with examples stemming from experience on assessment of student’s development. After discussion, the participants-Anvar Abbasov, associate professor and the director of Curriculum Center, staff of Curriculum Center, scientists, school teachers gave their feedbacks and views regarding arisen problem and were provided with detailed answers regarding the questions of their interest. Abdulla Mehrabov announcing the seminar closed, stressed that, the establishment of close between EPI and “Idrak mektebi” (School of Cognition) will serve for proud implementation of National Curriculum that is education standard of state. If you are like a lot of people you can simply overlook this. The real truth comes with being honest with yourself and your goals. This will lead to a sad and unfulfilling life. I like this information given and it has given me some sort of commitment to succeed for some reason, so keep up the good work. This site looks great on my iPhone, many look horrible or unreadable, but this design looks real crisp and clear on the screen. Nice one! A lot of thanks for all of the work on this blog. My mom delights in getting into investigation and it is obvious why. My spouse and i learn all regarding the dynamic medium you convey vital steps by means of this blog and as well as increase response from website visitors about this subject so my child is really learning a lot. Enjoy the remaining portion of the year. You are always carrying out a glorious job.